This is the site of an adobe fortification erected about 1856-57 by the ‘Independent’ faction in a dispute with the Mormons over a land title. The fort was maintained for about a year. This also is the site of the Indian village of Jumuba, and Jedediah Smith camped here in January 1827. 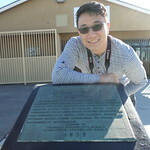 There is only a standing plaque for this landmark. It is on the southwest corner of S. Hunts Ln. and E. Oliver Holmes Rd. This place is now the home of a company called Superior Tank Lines.